River Escapes offers a range of sightseeing, party and exclusive charter cruises – our aim is to offer something for everyone. We offer cruises on the River Tyne and operate from Newcastle Quayside, next to the Gateshead Millennium Bridge. 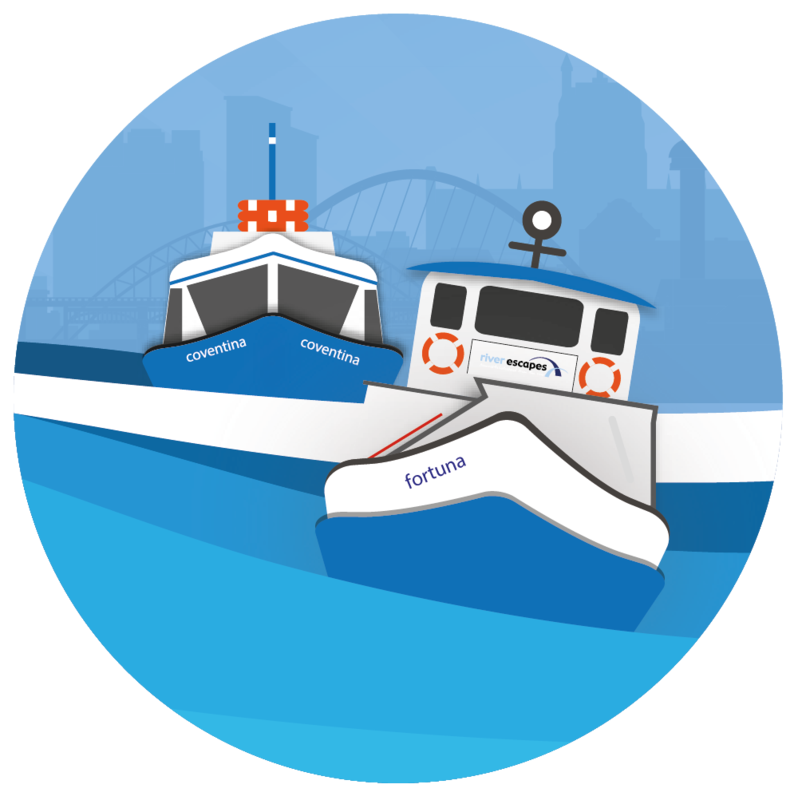 We operate two vessels – the Fortuna and the Coventina. The Fortuna–has two fully heated lounges, and viewing areas on the foredeck and the roof decks. This vessel has access for up to 5 wheelchairs. A range of refreshments are available to purchase on all of our vessels. All of our vessels are licensed premises – fully stocked bars. Our staff are friendly, welcoming, highly trained and always available to offer assistance to guests at all times. Clearly worded leaflets are available describing the main facilities, types of cruises available, cruise timetable, prices and directions. The leaflets include our contact numbers, email and web site addresses. Our cruises are accessible by car. We are located on Newcastle Quayside – follow the A186 signs to Newcastle Quayside from the city centre. Public parking is available nearby at Sandgate, St Annes and Quayside car parks. River Escapes is also accessible by the Quay Link bus service. The bright yellow buses run approximately every 10 minutes – early until late, 7 days a week. The bus stop is located next to the Swirl and is located directly opposite our boarding point. The nearest railway station is Newcastle Central Station within approximately 20 minutes walk. There are taxi and bus services available outside the station. Accessible taxi services are also located in Newcastle city centre. Car parking is public parking and charges apply. Ticket prices – please refer to our brochures or website for further information. Vehicles can drop off passengers at the Swirl walkway to allow disabled visitors access near to the boarding point. Access to the boarding point is on tarmac and paved walkways. River Escapes signs are displayed at the boarding point. Coaches can drop off passengers near to the boarding point and there is a coach parking available at the Sage Music Centre. A staff member will be located at the boarding point to greet guests and offer assistance if necessary. The sailing times for all of our cruises are listed in our brochure and on our website. The pontoon boarding area is a non-slip surface. Access to the Fortuna is by secured gangway. Access to the Coventina is directly from our pontoon – passengers must be able to embark and disembark unaided. On each of our boats – all internal areas are located on different levels and do have steps to negotiate. Floor plans for each boat are available to view on our website. The Fortuna has access for up to 5 wheelchair users and staff are available to offer assistance at all times. Access to all areas is by walkways and stairs. The boarding area is a flat non-slip surface. Table and chairs are also set out on deck areas. All seating and tables are fixed aboard the Coventina. There are toilet facilities on all of our vessels. We do not have disabled toilets however the toilets aboard the Fortuna are located on the same level as the access to the vessel. Hand-washing facilities are located in all toilets. There are refreshment and bar facilities on all of our boats – there are steps to negotiate to these areas however staff are on hand to offer assistance if required. Food can be purchased at the bar areas and brought to the tables. There are seating areas on the Fortuna with ample seating both outdoors and indoors. There is no smoking within any of the vessels – smoking is permitted however on the outer decks of the Fortuna. We regret we only allow guide and assisted dogs on our vessels. First Aid facilities are located in specified areas of all of our vessels and cruises will have a qualified first aider on board. Wheelchairs,mobility scooters and pushchairs can be stored for guests.